A 2000 Olympian, Leinemann teamed with Sydney partner Jody Holdren to captured the 1999 Pan Am gold medal in Winnipeg, Canada. Leinemann was married December 15, 2001. He and his wife Jane have a daughter (Ruby, born February 11, 2005). He is the son of Paul (a real estate developer) and Ruby (homemaker) Leinemann. He has three brothers (Mark, Robert and John) and three sisters (Patty, Liz and Roze). Most admired athete - Any athlete who is willing to challenge themselves to be the best they can be. Most admired person - His wife. Most memorable moment in life - The birth of his daughter. No. 1 Beach Volleyball site in Canada - Kits Beach in Vancouver because it�s beautiful. No. 1 Beach Volleyball site internationally - Rio de Janeiro because of the fans and their energy. Off-the-sand, he describes his personality - Do your best and do what you love. The people in life that have helped him - Brian O�Reilly and his wife. The people in Beach Volleyball that have helped him - Brian, John, Wally and Andy. The best advice he has received in life - All you have control of is what you do, you have no control of what others do. 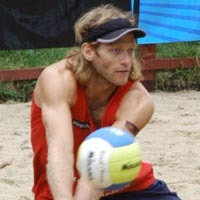 The best advance in Beach Volleyball - To push yourself beyond what you see as possible. The three people in history he would like to have dinner with - Jesus, Ghandi and Krishnamurti. When his beach volleyball career is over, what would he like to do? - Help people make money.